If you grew up in the frozen north, as I did, winter sports are probably a part of your life, or at least your childhood. One I spent the most time participating in, partly because it was a section of our gym class in elementary school, was ice skating. So when I found myself writing a book set in New York state in the autumn of 1900, my research led me to how popular skating was in the turn of the 20th century. People have been skating on ice for centuries. The Dutch seemed particularly fond of this activity. In the seventeenth century, when they settled upstate New York, the settlers from The Netherlands invented boats with sails and runners so they could navigate the Hudson and the “kills” in the winter. 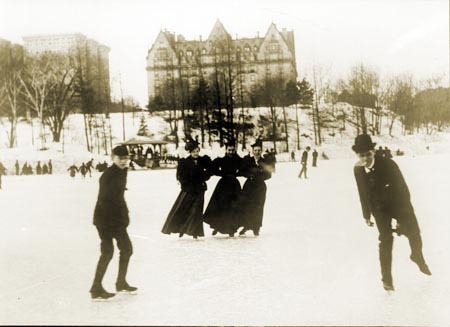 Around the time of the Civil War, skating became a popular activity in America; however, figure skating was stiff and formal. Then Jack Haines came along with a free-flowing style like a dancer on ice. But people didn’t like it, so he went to Europe, where he was a success. Not all figure skaters were men. In 1902, Madge Syres, an Englishwoman, came in second in the international championship. After that, the competition decided that a separate category for women should be formed because the skirts prevented the judges from seeing the feet—and other reasons that don’t make sense. She won the 1908 Olympic figure skating competition, the first to be included in the games. She and her partner came in third in a couple’s event like the judges may score a woman higher because he is attached to her. Theresa Weld (Blanchard) was one of the most prominent American female figure skaters, beginning her championships in 1914. In 1920, she competed in the Olympics, but added a jump to her routine and annoyed the judges because women weren’t supposed to jump. Their skirts could fly up. She still won the bronze. As an aside here, not until 1924 was figure skating included in the winter Olympics. This craze for skating spawned a few rather odd inventions. One of these I ran across while researching The Honorable Heir (LIHP, May 2014) set in Tuxedo Park, New York, was a skating chair. Think an armed dining chair with runners. 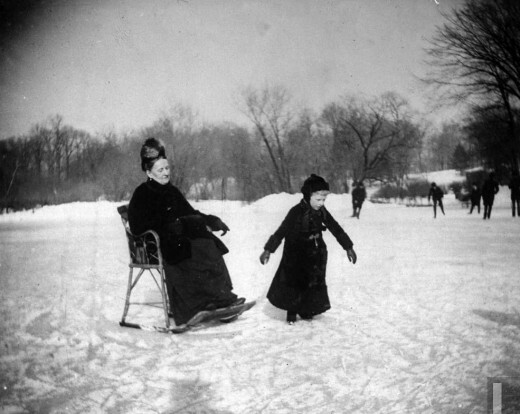 Someone sat in the chair, yes, ladies with their billowing skirts and all, and were pushed across the ice. Sounds like fun and potential mishaps waiting to happen for this Author, who couldn’t resist including this strange device in the book. 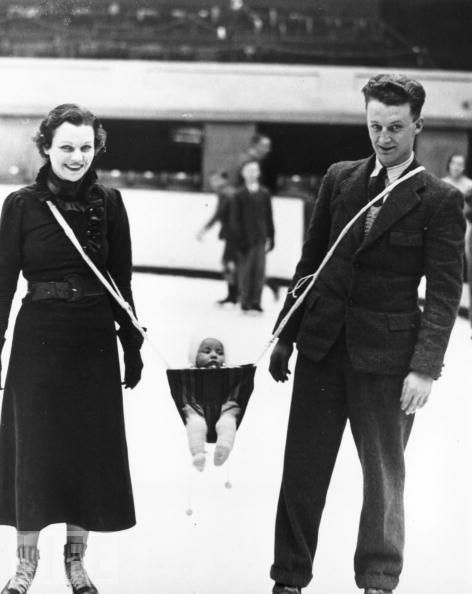 Later in the 1900s, 1937 to be exact, a hockey player named Jack Milford devised a “baby holder” This device was so that a couple could carry their baby between them as they skated across the ice. What do you think of this contraption? If you want to see what I did with the skating chair in The Honorable Heir, the book releases the first of May from Harlequin LIHP. 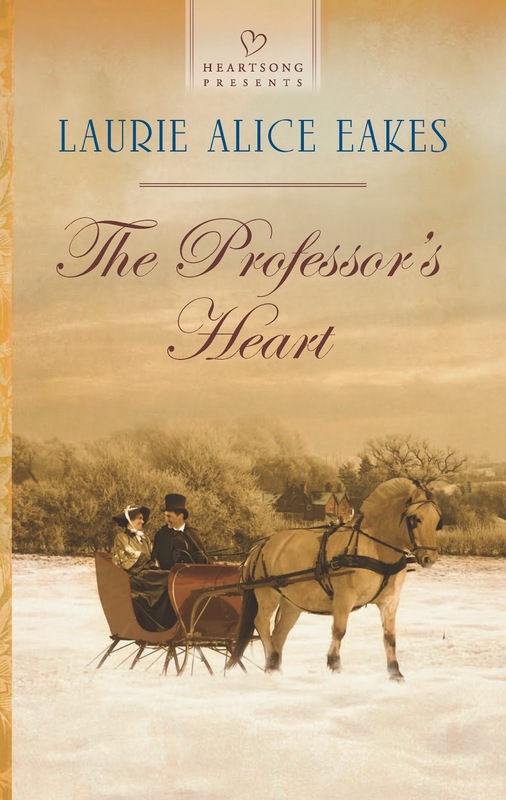 Laurie Alice Eakes’s sixteenth book, The Professor’s heart, also features a wintry landscape, this in Hillsdale, Michigan, but sledding and sleighing rather than skating. I was a little shocked by that babyholder. The skating chairs look like fun, though. Oh, my! I wasn't aware of such skating contraptions. I love Melissa's comment about the baby holder! The skating chair does look like fun, but I can only imagine the accidents waiting to happen. Hi, I have never ice skated but it sure looks like fun. now riding in a sleigh driven by horse is one of the things I hope I get to do one day. it looks so romantic and I love romance. I like the look of your book, thanks for sharing your thoughts on ice skating through the years...how interesting. Ice skating is fun, and ice is pretty hard to fall on, so the learning is tough. I grew up doing winter sports, as a Michigan native. I don't remember hating winter as a kid. We ice skated as part of gym class in elementary school. I love this post, so very interesting. Who knew?!!! What a great post, Laurie Alice! I LOVE the ice skating chair and baby holder! What a hoot! Never knew such things existed! I never could stand up on ice skates, but I love those who do it well. Looking forward to watching the ice skating on the coming Olympics next month. Thanks for sharing all this fun info on skating! That baby holder looks downright scary, but ice chairs look like a lot of fun. Interesting post! I think the baby holder would fall under reckless child endangerment today. If one of them fell it could kill the baby! How scary! That baby holder sling looks like an accident waiting to happen with a lawsuit and/or child endangerment ticket slapped on the end! Holy cow, that's just scary looking! As for the skating chair? Yes, please!! Where do I sign up? Hehehe! Wicked fun post, Laurie! Finding things ike this to incorporate into my story are what make research so much fun.